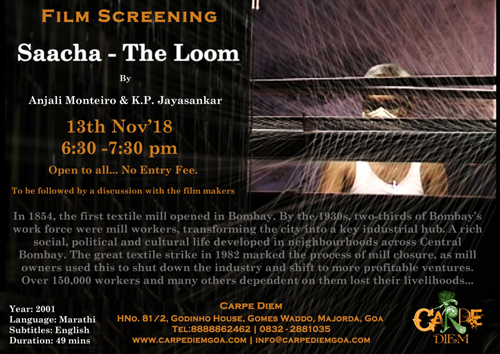 Film screening of a documentary "Saacha - The Loom" by KP Jayasankar and Anjali Monteiro. Through the poetry of Narayan Surve, the paintings of Sudhir Patwardhan, the music of the Shahir Amar Shaikh Cultural Troupe and the filmmakers’ images of a precarious yet resilient space, Saacha chronicles the changing life and times of Mumbai city that was once the hub of the working class movement in India. A discussion with the filmmakers will follow post screening.